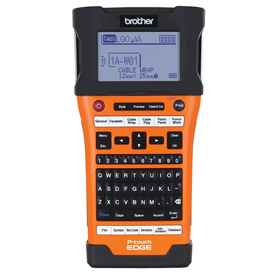 Brother PT-E500 - The PT-E500 industrial handheld labeling tool kit comes with design software to help integrate into work flow processes. Design and print labels from a computer, or link to a database to save time and help reduce errors. Download the designs with a database and print virtually anywhere without a computer. Smart technology, QWERTY keyboard, automatic cutter and a large backlit display helps make the PT-E500 easy to use to print wider labels for marking cables/fiber/wire, faceplates, patch panels, punch blocks and more. Also prints on heat shrink tubing. Comes with software, case, Li-ion battery, adapter and 2-year limited exchange warranty.